Despite the enormous popularity of games for the iPhone and iPod touch, some genres remain relatively untouched. The role playing game category, for example, would fill up less than a page at the App Store, and that includes dice-rolling utilities for fans of pen-and-paper Dungeons & Dragons games. Fortunately SoMoGa has filled the gap with Vay, a graphical role playing game that’s quite fun. Vay is actually a retread of Vay: Ryuusei no Yoroi, a game that was last seen for the Sega CD—an ill-fated accessory for the Sega Genesis console—way back in 1994. If the name doesn’t ring a bell, don’t worry. Though Working Designs localized this Japanese-made RPG for sale in the U.S., the Sega CD wasn’t a very popular system here, though it has its fans. Two on One: Combat is turn-based in Vay; you can choose to fight or run. Vay is a very typical Japanese role playing game, and features 10 minutes of anime-style cutscenes that tell the story of Heibelger, the crown prince of the medieval world of Lorath. On his wedding day, Lorath is attacked by an army of mecha—giant robots from another planet—and Elin, his bride-to-be, is kidnapped. His father, the king, is killed in the fracas, and Heibelger must go on a quest to save Lorath and Elin from certain doom. If you’ve ever played the classic Final Fantasy games, you’ll have a good idea of what to expect in Vay. Much of your time is spent traveling over a map as you go on quests, visit different villages and towns and interact with important characters on your quest. 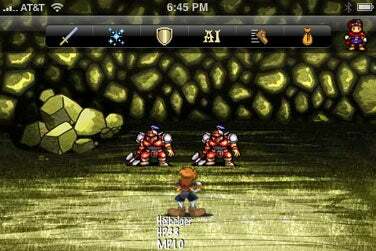 But when you enter combat, the screen changes to an over-the-shoulder view that displays information about your party and your opponents, and combat unfolds in turn-based style. Heibelger befriends other characters as he wends his way through the kingdom, each of them helping him build a party to face off against increasingly challenging foes. He meets a wizard, mercenary, bard and others along the way. Vay’s interface falls a bit short when it comes time to use or discard items, manipulate equipment, magic spells or examine status—it’s pretty easy to get lost in a maze of nested menus and lose track of what you’re doing. But I have to give credit where it’s due: Vay is an engrossing and entertaining game that will definitely appeal to classic Japanese RPG fans. Vay is compatible with any iPhone or iPod touch running the iPhone 2.x software update.